Really looking forward to your posts, if you still want to join in go ahead please - this link up is open until Midnight next Monday just in time for week 2 to start :) For more info on each week please click here. Guest Post // How Many Is Enough? In this world of dual-income families with 1.86 children, I am treated a little strangely by most people for even considering ‘more’ children. I think it would be OK if I lived in America. In the States, I would be considered normal – particularly if I already had 4 sets of multiples and was homeschooling them (now that, I would NOT want to do). The truth is I do already have three children aged 5, 3 and 4 months. With such a little baby – my husband and family think I must be hormonally deluded to consider wanting more but deep down I always wanted 4. Actually, I can vividly remember writing down the names for my EIGHT children that I thought I’d have when I was about 14. Thankfully, I’ve since realised having EIGHT would be crazy and have moved away from the names Odette and Poppy-Lou. I do, however love to watch any programmes about large familes and admire in awe…… 16 Kids and Counting, The Duggars, John and Kate, The Waltons (as in the sextuplets or both programmes actually!) – I love them all. I think the truth is I just can’t fathom that the ‘baby making’ part of my life is over, I always wanted a family surrounded by chaos and noise and wanted them to have lots of brothers and sisters to play with. However, also in my dreams was a very large garden for them to meander about in and climb treehouses and make dens and a perfectly tidy house and a lovely large dining table. Our garden and dining table and house would be a squeeze with 4 children *sigh*. I think I will regret not having just one more but nobody seriously regrets having children – do they? I once met a lady who had two and constantly talked about how she wanted three. She was bitter and saddened and I don’t want to be that lady. It’s not that my life with three children is a peaceful haven of calm. Last night, I had to throw away one of my children’s Easter eggs because they wouldn’t go to bed and If I’m being honest, it’s a constant struggle to be the kind of mum my kids deserve. Most days, I’m making a ton of mistakes. But when life with little ones feels too crazy, I am trying to perfect the epiphany moment. The moment when I remember that these fussy toddlers and high maintenance babies will become real people, with real jobs and their own families and that makes their little ‘quirks’ (such as refusing to put their shoes on the right feet……..) seem easier to manage. Right now my kids are 5,3 and 4 months and if I had another one any time soon, that would be 4 under 6. However, when they are 10,7 and 5 – things will be different and when they are 25, 23 and 20 – even more so. I prefer to think of the gains later than the stress I’m knee deep in now. and no one feels sorry for you. But if you have FOUR children, then you have a free pass for everything! If your house is messy – don’t worry, you have 4 kids! (and if it’s clean – even better because people then think you are a domestic goddess!) Your clothes don’t match, your roots are showing, you’re a little on the tubby side – don’t worry! 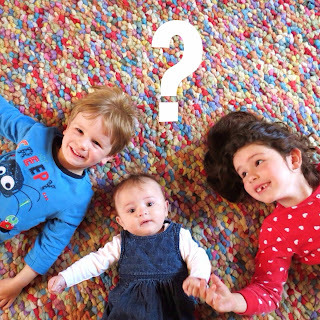 Who expects you to have any time to look after yourself when you have 4 little ones? So, I’ve been thinking. How do you know when you’re done having kids? Do you just wake up one morning and realise the urge to procreate is gone? Or is it a slow, steady trickle of daily realisations? Here is my compilation of the inklings that let you know you’re done with all this baby-making lark. 1. You become super excited by selling all your baby stuff on EBay and watch avidly for the money to come rolling in. 2. You buy a dog and call it that ‘perfect baby name’ you’d been saving. 3. You are excited by the prospect of your kids growing up and becoming more self-sufficient. You’ve even written a bucket list for the ‘child-free’ days. 4. You’re literally throwing the car seats out of the car and dreaming of a sports car. 5. When someone announces they’re pregnant at work, you offer your commiserations. 6. You use 3 forms of birth control…..just to be safe. 7. You practically push your youngest child into school on their first day: “yes, you’ll love it…you really will” and skip down the road without looking back. 8. You can hold a newborn and easily pass it back to its mother when offered a glass of wine. 9. You ask to be re-seated when you’re placed next to a family with toddlers in a restaurant. 10. In the supermarket, you look on with sympathy at the sleep-deprived parents in the nappy aisle. I watch quite a lot of reality TV programs especially ones with babies involved such as Teen Mom. They are always throwing the most amazing (and to be honest quite over the top) baby showers. They are becoming much more popular over here in the UK now so when I was pregnant I knew I wanted one. I didn't want anything over the top, I don't think they should be about getting a crazy amount of gifts, it's more about enjoying your bump with family and friends! My sister took on the roll of host and planned it all for me which I think is a much better idea, as I had so much more on my mind by then. It was planned for one afternoon when I was 33 weeks pregnant. This might seem quite early but I think it worked out okay, as I had my energy and wasn't too much of a whale by then haha. I only had close friends and family as again I didn't want an over the top affair, I just wanted to celebrate with those I was closest too. My sister purchased the decorations from Ebay, they have a great selection of both boy and girl designs and low prices. She had hosted my sister's baby shower for my nephew so decided to get the girl version of those decorations which I thought was a cute touch. She also provided a great spread of food, because what's a party without a few party rings haha! We began by opening the gifts. We were so grateful for everything we received, as we didn't expect anything! There was so much pink and girly bits, I think Jack felt a bit girly surrounded by it all haha. It was great having him there with me though, as I think it was a celebration for us not just me. We then played a few baby shower games; this was by far the best part of the evening! The first game was the nappy challenge. Laura bought a selection of chocolate bars and then melted them down inside nappies.. you can guess what they looked like haha! We then had to smell/taste to guess what the chocolate bar was. It was so funny watching everyone licking the nappies as the contents did look pretty gross (especially the snickers as it had bits in it.. ewww!). Next was the baby food challenge. Again Laura has pre-brought some baby food jars without us knowing. Without looking we had to taste to guess what the flavour was. They tasted horrific, I can't believe babies actually like them haha. I know they were cold but they just tasted like mush, with the weirdest flavours. The funniest bit was when Jack actually finished one of the jars.. crazy boy! I had an amazing time, and would definitely recommend that everyone had a baby shower. It's a relaxing time and it took my mind off waiting for little miss to arrive.. well for that evening anyway! Not the best badge in the world so I do apologise but first one I have ever made - proud moment! A brand spanking new blog for the Twitter community that is @mummy_bloggers - creater of the weekly #mblogchat which is every Friday 8-9pm :) The newest community for mummy bloggers, we pride ourselves in being a place where you can have a general chit chat, make friends, get some advice but mostly share and promote blogs. Not only do we have a Twitter page but also an Instagram, Subscribe By Email, Facebook, BlogLovin for you to follow by the links on your right. Be sure to follow them to keep up to date! As you can see on your right, there is a beautiful new blog button which if you wanted to put onto your page that would be absolutely amazing and there is also a poll to see what you would like to talk about in the next #mblogchat! If you would like to be some of the first guest bloggers then please let me know - the rules are it can be anything you want to write about that you think your fellow mummy bloggers will be interested in. Looking for around 2 different bloggers a week!